A deluxe, gatefold 180-gram 25th Anniversary Edition of one of the most significant pop releases in music history! Includes a bonus LP with previously unreleased tracks, mixes and an unreleased song from the Thriller sessions. Released November 30, 1982, Thriller would go on to break all sales records while garnering a record seven Top 10 singles and 12 Grammy nominations. It remains one of only three albums to stay on the Billboard 200 Top 10 for one full year. 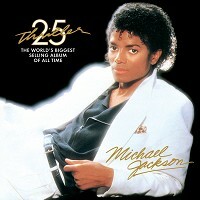 This 25th Anniversary Edition of Thriller celebrates this ground-breaking album with previously unreleased tracks. New tracks include exclusive remixes from Kanye West, Akon, Fergie and will.i.am along with previously unreleased tracks from the original Thriller sessions, newly mixed and mastered by Michael Jackson. Customer Reviews (3.63 Stars) 8 person(s) rated this product. Ugh. Very disappointed in this release. Thin hard overly bright. Great albumb, must have. Albumb sounds fantastic! Unfortunately I was really disappointed with the sound quality of this recording. Very bright sounding. The extras seem much better mixed. Not recommended as an audiophile recording. I really love this album. Makes me remember back to when I was a kid. The only problem I have with this pressing is the amount of surface noise on the record. Pretty surprising for a newer pressing. That said, it is much better than my original LP from back in the day. OMF'ingG---BUY THIS ALBUM! Just received mine, this album sounds absolutely QUIET, little to no surface noise. That's just the beginning---the sound quality will mesmerize you, staging, imaging, detail, I have NO complaints about this pressing. I am an avid vinyl collector, Thriller and Bad are now among my BEST quality albums period, and this ranks right up there with my MFSL and UHQR pressings. To all who helped produce these two albums---NICE JOB! To you the reader-stop thinking about it and buy several copies, you will wear one out from playing so much, it does sound that good---get a backup copy before these gems are out of print. Enjoy! The audio quality of this recording is great! Compete well with recordings being made more than 25 years later. The second disk with the remixes is not my cup of tea. The remixes are as much trash as all remixes are.